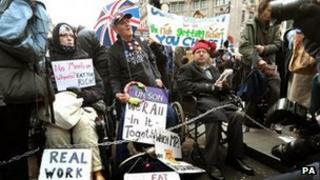 People in wheelchairs chained themselves together in anger over welfare proposals, blocking traffic in one of London's busiest shopping areas. Disability campaign groups and members of direct action organisation UK Uncut chanted, held banners and banged drums in the middle of Oxford Circus. Campaigners say the changes in the Welfare Reform Bill would see half a million people lose their benefits. The government said it wanted a simpler and fairer welfare system. The proposals, which are due to come into force in 2013, include introducing a single universal credit. The bill, currently going through Parliament, also includes a cap on benefits to about £500 a week, or £26,000 a year - the level of the average salary of working families. Last week the government was defeated in the Lords on that and other aspects. The Disability Living Allowance would be replaced with a new allowance, Personal Independence Payments. This would involve upfront medical tests and regular assessments for working people aged 16 to 64. UK Uncut said 15 wheelchair users chained themselves together in Oxford Circus at about 12:00 GMT, blocking traffic in part of Regent Street until about 14:30. They were supported by about 250 people, a spokeswoman said. One of the wheelchair users, referring to himself only as Andy, said the changes could be "devastating" for disabled people. The 37-year-old, from Islington, north London, said: "The whole raft of cuts that are being carried through will affect all of the services that support disabled people - public services, social care, the voluntary sector - all these are being cut and disabled people disproportionately depend on these services. "To reform one would have a big impact, but reforming them all is going to be devastating for those who depend on them." Rosemary Willis, from Disabled People Against Cuts, added: "Maria Miller, so-called minister for disabled people, has repeatedly stated that we are 'financially unsustainable' and we want to ask this government exactly what they mean by that. "We will not let this government push through these changes which have already led to disabled people taking their own lives." Media captionAdam Lotun, Disabled People Against Cuts: "All the assessments are unfit for purpose"
Josie McDermot of UK Uncut said the bill was "cruel and unnecessary" and added that the protest was an "essential way to persuade the government to scrap their plans". A Department for Work and Pensions spokesman said the government was "absolutely committed" to supporting disabled people and it was spending more than £40bn per year on disabled people. "Households where someone receives disability living allowance will be exempt from the benefit cap and we are giving local authorities an additional £190m over four years to ensure vulnerable people are supported through the housing benefit reform, so we are not expecting people to become homeless," he said. "The introduction of the universal credit from 2013 will see a simpler and fairer system of support for disabled people." He added disabled people in greatest need would receive more support than they do currently. Other changes in the bill include an under-occupancy penalty for council and housing association tenants with spare bedrooms, means-testing the Employment and Support Allowance (which replaced incapacity benefit) after 12 months and charging single parents to use the Child Support Agency.